I am not a big scrap book person not that I don't love to create them but I often find it hard for subject matter. I have no children and frankly I can only do so many pages of my fur babies. I do them of my trips but other than that unless there is a wedding or someone has a baby my designs are usually missing pictures until I find some to add. Yes, I have blank pages waiting for the perfect picture and that works for me. Today's post is of my second cousin who got married last October. I loved the fact it had my favourite Aunt and Uncle along with my cousin (their granddaughter) in it and decided it needed scrapping. 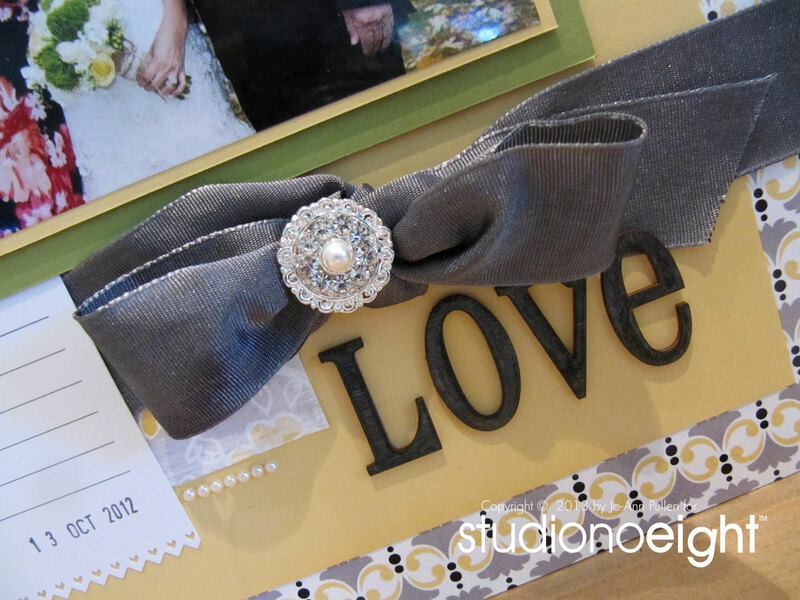 For this project I used a mixture of Stampin' Up products and Teresa Collins - Carolina Breeze Collection which I absolutely love, grey is my new black. I found these wonderful rhinestone pins / buttons on Etsy and love the wooden letters from Studio Calico inked and varnished. I didn't write anything other than adding the date as this was a gift for my Aunt and Uncle so I left blank so they could add their own message / memories. What a great page! I'm so glad you are posting your fabulous scrapbook page creations - you are AWESOME! Love all the elements in this page - thanks for my morning inspiration! Do Not Disturb We Had to Much Fun!